At least eight out of ten will choose to directly remove the unwanted files within their Android devices when they want to delete some files. But do you know these deleted files can be easily recovered with a professional data recovery tool? So if you want to permanently wipe out files from Android phones, you need to find a professional tool like this Android Data Eraser to permanently erase any files as you wanted and needed! 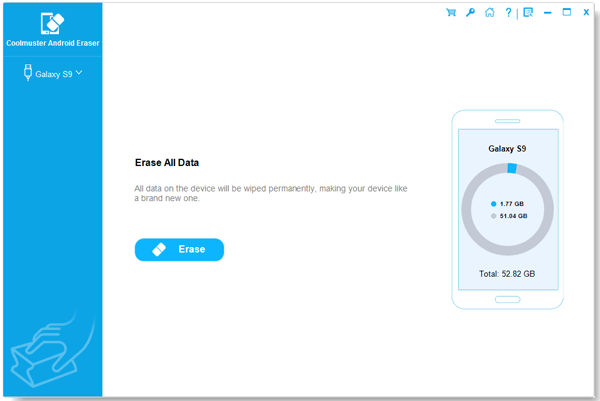 With this professional data eraser software, you can easily erase different files from Android phones with zero possibility of being recovered. All files are perfectly compatible including contacts, messages, music, videos, apps and many mores. No matter how large the amount of files you want to erase from Android phones, you can always use this software to easily and safely wipe out unwanted files. 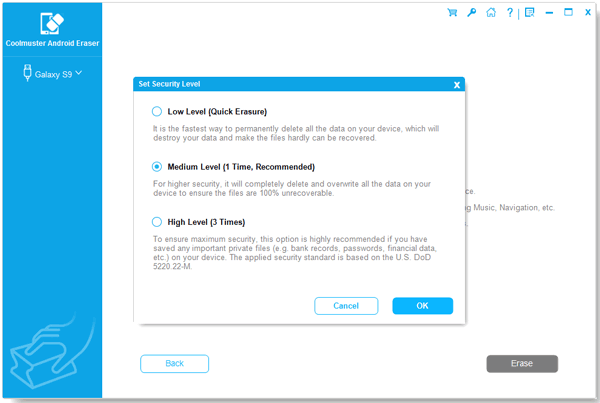 More importantly, this software can also be used to clean up useless junk files from your device, so as to speed up the device and free up more precious space. As to the device compatibility, as long as your device is running Android operating system, this software is surely the best choice for you to erase files and clean up junk files! Below is the free trial versions! You can give it a try by yourself! To start with, open the installed software on the computer and then get your Android phone connected to the computer via the USB cord. You will then see an interface where you are required to choose the erasing mode and erasing level. Then you can see the below interface where different file folders are arranged on the left panel. You can then enter the right tabs to preview more detailed information and choose the files you want to erase from your Android device. Finally, just wait for the process to get completed within a little while. So now want to give it a try by yourself? Just go ahead!